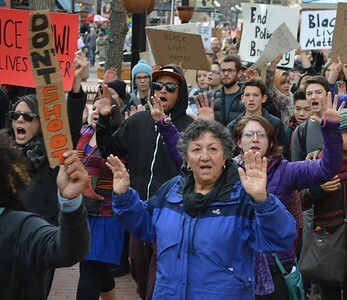 Demonstrators in Boulder, Colorado rallied then marched down city streets, frequently blocking busy intersections by staging "die- ins", to protest the Ferguson grand jury decision. 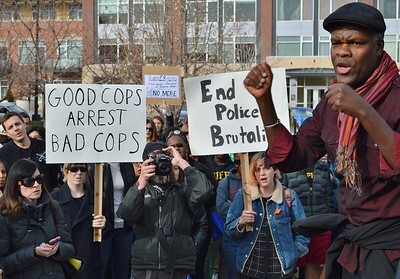 African American man gestures with hand while speaking to crowd of protesters, two demonstrators hold signs about [police brutality. one man taking picture with camera. 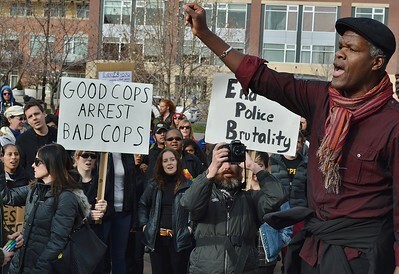 African American man gestures with both hands while speaking to crowd of protesters, two demonstrators hold signs about [police brutality. one man taking picture with camera. 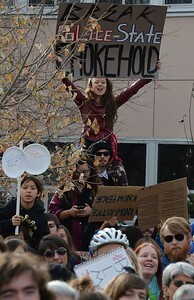 Young woman sitting on shoulders of young man, raises sign above head about police "chokeholds", other protesters with signs in front of them. 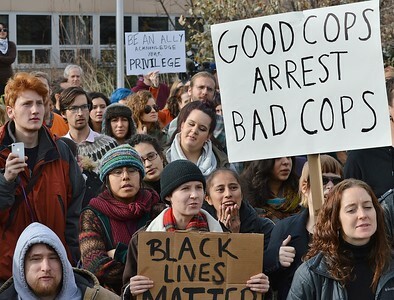 Group of demonstrators with signs at Ferguson solidarity rally. 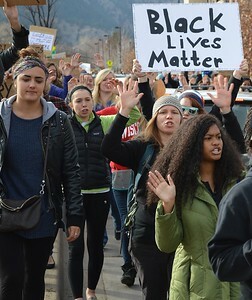 Two young women with hands raised in the air, behind them protest marchers with signs including one with sign "Black Lives Matter". 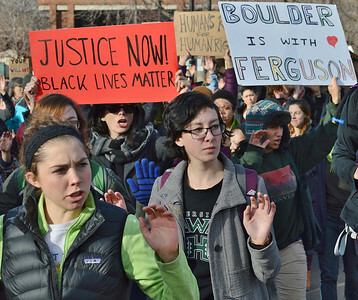 another with sign "Boulder is with Ferguson". 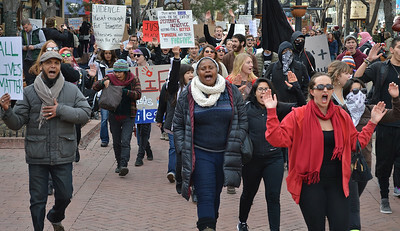 Group of protesters marching with hands raised in the air, including woman with sign "Black Lives Matter". Man holding young daughter on shoulders, around them protesters with signs about Ferguson and police brutality. 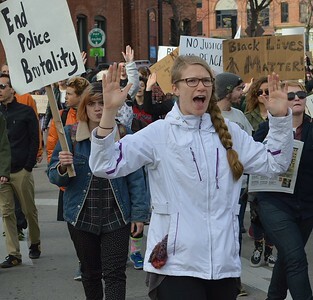 Group of young women marching with hands in the air, one holding up sign, "Black Lives Matter", other protesters wi9th hands raised in the background. 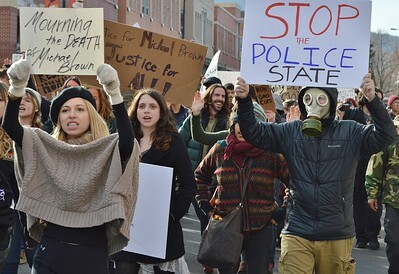 Man wearing gas mask raising sign above head "Stop The Police State", next to him young woman wearing beret raising sign above her head "Mourning The Death of Michael Brown", other protesters with signs marching behind them. 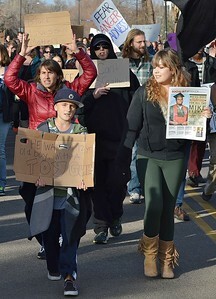 Young girl and young boy in front of large group of protest marchers, girl holding newspaper with picture of Michael Brown on it, boy carries sign about 12yr old shot while carrying toy gun. 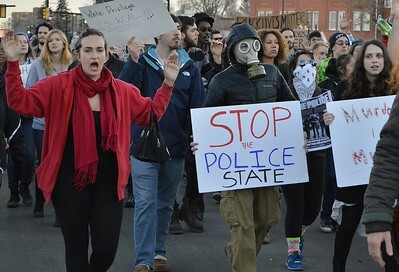 Man wearing gas mask holding sign "Stop the Police State", next to him woman shouting with hands raised in the air, other demonstrators marching behind them. Large group of marchers with hands raised in the air, some carrying signs about police shootings. 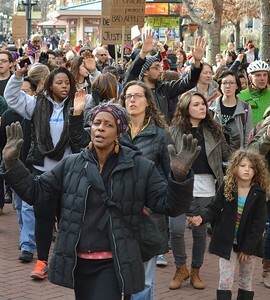 African American woman marching with hands raised in the air, behind her other protesters with hands in the air, some carrying signs. 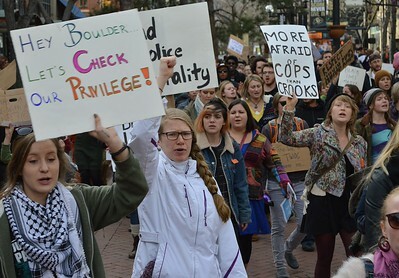 Group of young women marching with signs about police brutality and white privilege, large ghroup of protesters in the background. 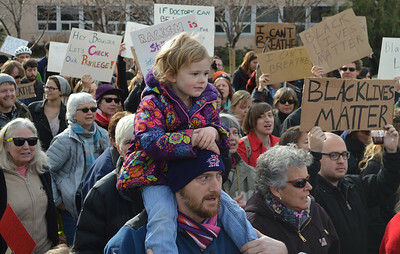 Young woman in white coat with hands raised in the air, other protesters marching behind her with signs about police brutality. 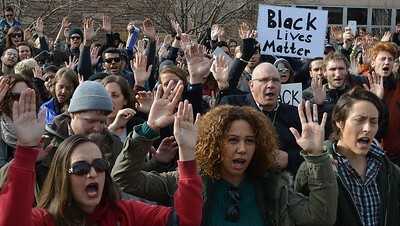 Large group of demonstrators with hands raised in the air, sign in background, "Black Lives Matter". 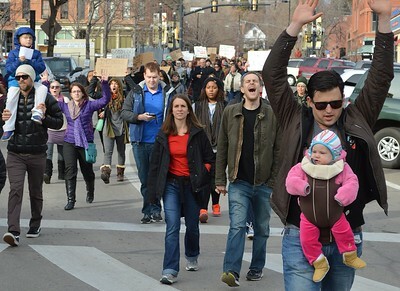 Man with child in baby carrier, raises hands in the air, other protesters marchers behind him including another man carrying young child on his shoulders. 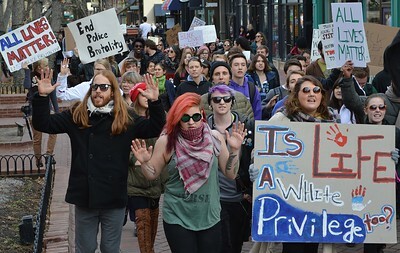 Large group of protesters marching with signs about Ferguson, police brutality and white privilege, in front of march, group of young women, one with orange hair, another with purple hair. 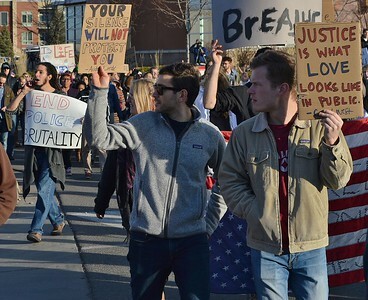 Two young men with signs at Ferguson protest looking to the side, other marchers behind them. Woman shouting while raising sign above head about police killings of black people, other protesters marching behind her. large goup of protesters marching down center of street, some on median, many carrying signs about Michael Brown shooting in Ferguson. 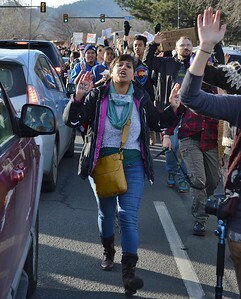 Young woman marching through line of cars in the middle of the street, shouting with hands raised, other protesters behind her. 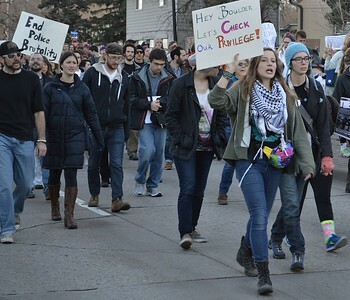 Young woman wearing a keffiyeh, shouting while holding up sign about "privilege", other protesters marching in the background. 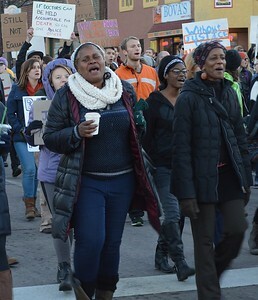 Three African American women shouting while marching, one wearing peace sign earring, behind them other protesters with signs. Large group of protesters marching down middle of city street, many with signs and banners, some with hands raised in the air. 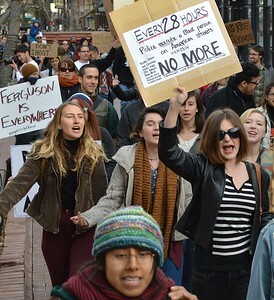 Large group of protesters marching in street with hands raised in the air, many carrying signs about Ferguson. 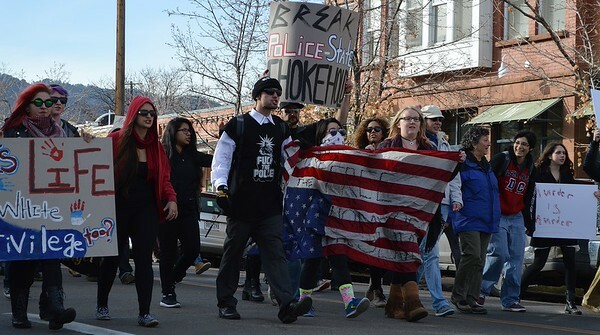 Line of protesters marching in street, two carrying upside down American flag. 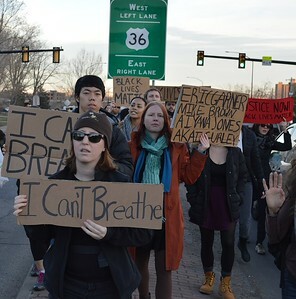 Two people in a car in traffic, raising their hands out of the car windows, in background, long line of protesters with signs and hands raised in the air. 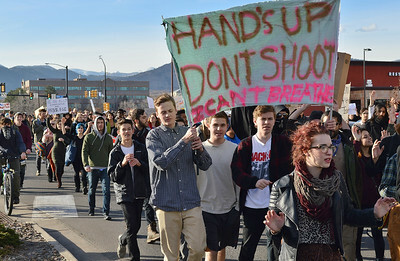 Young men marching with banner "Hands Up Don't Shoot, I Can't Breathe", large group of protesters in the background. large group of protesters marching with signs about police brutality, some have hands raised in the air. Group of protesters with signs about police shootings, standing on the median of a city street, above them street sign for US route 36. 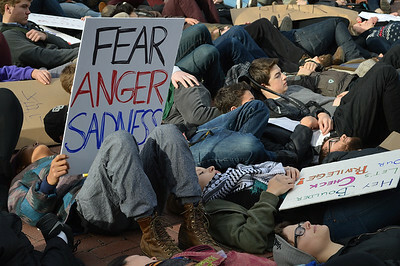 Group of protesters lying on the ground, one holding sign "Fear, Anger, Sadness". 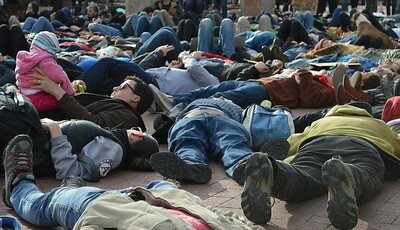 Large group of protesters lying down in middle of an intersection, some holding signs, including a pregnant women with sign "White Silence = White Consent", next to her two parents and two chilren lying on the ground together with arms around each other. 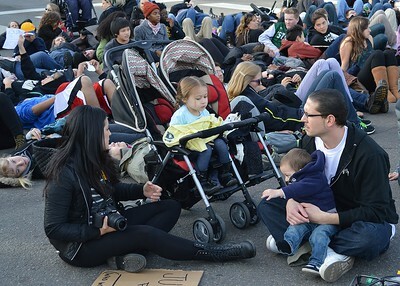 Large group of protesters sitting in the street, including two parents with two children, father holding one child, other child in stroller, mother holding camera. 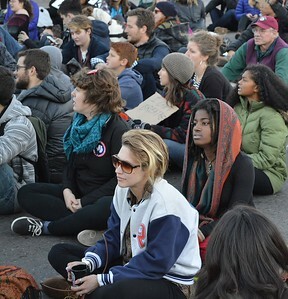 Group of protesters sitting in the street including young African American woman with bright coloraed scarf on her head. 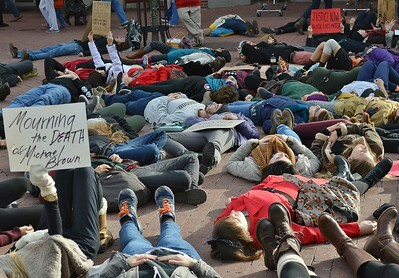 Large group of protesters lying on the ground, one holding sign "Mourning the Death of Michael Brown". 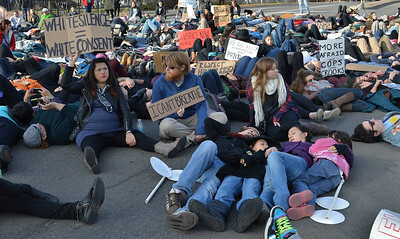 Large group of protesters lying on the ground, including man with young child sitting on top of him. 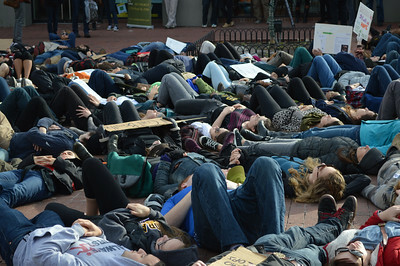 Large group of protesters lying on the ground.